The 2015 Founders conference was on Baptist Covenant Theology. There was a Q&A Panel with Pascal Denault and Jeffery Johnson. Below are my thoughts on the questions that were asked. Genesis 15 seems to be an unconditional covenant wherein God takes the obligation upon Himself to fulfill it. How is this only a promise in the Old Covenant, and not a covenant within the Old Covenant? How does this fit into the Old Covenant/New Covenant? 1) God is swearing by an oath that what He promised will be fulfilled. Abraham wanted to know how he could be sure, so God re-assured him in this vision of a covenant oath. 3) God does not say this promise will be received through faith alone apart from works. 4) In fact, God specifically says that work was required to bring about the fulfillment (Gen 17:2, 9-14; 22:16-18; cf Gal 5:3; Acts 15:10). As John Murray states “The obedience of Abraham is represented as the condition upon which the fulfilment of the promise given to him was contingent and the obedience of Abraham’s seed is represented as the means through which the promise given to Abraham would be accomplished. There is undoubtedly the fulfilment of certain conditions… At the outset we must remember that the idea of conditional fulfilment is not something peculiar to the Mosaic covenant. We have been faced quite poignantly with this very question in connection with the Abrahamic covenant. And since this feature is there patent, it does not of itself provide us with any reason for construing the Mosaic covenant in terms different from those of the Abrahamic.” And the Mosaic is of works (Lev 18:5; Gal 3:12; Rom 10:5). 5) And thus Gen 15 is properly part of the Old Covenant, which includes the promise that Christ will come from Abraham (Rom. 9:5). 6) And it relates to the New Covenant in that it promises the future establishment of the New Covenant, and it typologically reveals information about it. See also Is the Abrahamic Covenant Conditional or Unconditional? How do you respond to dispensationalists who say Israelites occupy the promised land today because of the Abrahamic Covenant? Dispensationalists might object by saying that God promised this land to Israel unconditionally and as an everlasting possession. First, note the answer to the previous question with regards to works and the Abrahamic Covenant. Furthermore, if God gave them the land unconditionally, how could God have set conditions upon Israel in the Mosaic Covenant? How could he have exiled them? How could he have kept them out of the land for 2,000 years if it was promised unconditionally? The answer is that it was not promised unconditionally. Furthermore, as Paul explains in Romans 9, even this conditional promise to Abraham’s offspring regarding the land was never made to all of Abraham’s physical offspring. It was made to Isaac, not Ishamel; to Jacob, not Esau; and on down through history God sovereignly chose who this promise extended to, until it extended only to Christ who fulfilled it typologically, and thus it was made only to Him (Gal 3:16). Would the part of the Abrahamic seed concerning the fallen seed be considered of works or conditional? If so, how can we say it was of works and grace? See the two previous answers. How much of a threat is NCT? I agree with both Johnson and Denault’s answers. I wouldn’t phrase it as “a threat.” I do believe that the implications of NCT rejection of the moral law of God is unbiblical and has significant ramifications to systematic and biblical theology, as well as in the practical life of the Christian. However, there are also points of agreement we have with NCT over against Westminster Federalism, which need to be acknowledged and emphasized. Here are some of my posts on NCT. Why is covenant theology important? Because Scripture organizes itself according to the covenants that God makes with men. Therefore the way we understand them has systematic implications for how we understand all of Scripture. As just one example, current debates in reformed circles over the doctrine of justification and the place of works is directly related to how people view the covenants in Scripture. Did Jesus tackle the Old Covenant/New Covenant distinctives? In addition to Denault and Johnson’s good answers I would add that John 15:1-6 is a very good articulation of the distinction between the two. See my post on that here. Who is the federal head of Israel? We need to be careful in how we talk about federal headship. It is true that God establishes covenants with representatives, but that does not mean that those representatives always fulfill the exact same function as heads/representatives of other covenants. With regards to Israel, we can say that to a large degree Abraham was their federal head. Note especially Kline’s comments above: Abraham’s obedience secured Israel’s initial entrance into the land of Canaan (and as I explain here, this “drove away the birds” ie it held off Israel’s curse). But under the Mosaic Covenant, Israel’s obedience as a nation became the focus, and this requirement for obedience was then later focused on a representative head as king of Israel in the Davidic Covenant, such that the kingdom rose or fell in accordance with the obedience of the king – which is typological of Christ’s kingship. In Gal 3:17 it seems the promise and covenant wording is used interchangeably. If righteousness were through the law, then Christ would not have to die (establish the New Covenant). But God confirmed to Abraham (via a covenant oath) that Christ would die and bless all the nations. Therefore, God did not later establish a means of obtaining righteousness through the law, because that would nullify his previous confirmation that Christ would eventually come to establish righteousness (inheritance) through His death. If righteousness were through the law, it would be pointless to promise a future Christ. God promised a future Christ, therefore righteousness is not through the law. This does not mean the Abrahamic Covenant is the New Covenant. It simply means that God promised the New Covenant, so he therefore did not establish an alternative means of salvation. To elaborate on the distinction above between the Abrahamic Covenant and the New Covenant, consider the example (recognizing that all analogies fail at some point) of this wedding covenant/contract. If you click the link, you will see that it is not a marriage covenant, but a contract regarding the performance of the wedding. amended or changed unless executed in writing and signed by The Salem Herbfarm and the CLIENT. Once signed, this covenant confirms that the wedding will take place. Once confirmed, the contract is binding and cannot be amended or changed. “To give a human example, brothers: even with a man-made covenant, no one annuls it or adds to it once it has been ratified.” But the actual wedding still has to be performed, because this wedding covenant is not the marriage covenant, it simply guarantees the marriage covenant will occur. If a couple signs this contract, they will not sign a different contract that says the wedding will take place somewhere else. That would violate this contract. So, in short, I believe Gal 3:17 teaches that God promised, via the Abrahamic Covenant, that the New Covenant would be established to grant sinners eternal life. Therefore God did not establish the Mosaic Covenant to offer sinners eternal life. 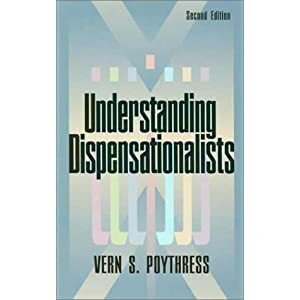 I may be a bit late to the ballgame (published in 1987), but I just finished Vern Poythress’ Understanding Dispensationalists and I really enjoyed it. Poythress took a sabbatical to study dispensationalism in depth and this book is the result. I have heard it mentioned in many other places as a breakthrough in covenant-dispensational dialogue. I do want to note one important point. The chapter Interpretive Viewpoint in Old Testament Israel was particularly helpful. Poythress, very succinctly and cogently, argues that seeing typology (symbolism) in Old Testament prophecy is not opposed to a commitment to the grammatical-historical hermeneutic. Typology is not just something that we can look back on and see now that Christ has come, but it was something that could be understood by Israelites in the Old Testament (though not in full detail). Israel’s existence as a kingdom of priests therefore possessed symbolic significance. This does not at all mean that Israel’s priesthood was “merely” symbolic or “merely” something of illustrative or pedagogical value. It was not “merely” an illusion, reflecting the “real” priestly reality in heaven. No, it was substantial, it was “real”–on the level that the Israelites could take it, and on the level appropriate to the preliminary character of God’s deliverance and his revelation at this point. The true God, not merely a surrogate for God, was really present with Israel. And his presence meant their consecration as priests. Yet God was not present in the way and with the intensity that he is present at the coming of Jesus Christ. His presence with Israel was preliminary and “shadowy” in comparison to that. The latter days mentioned in the prophets are that broad eschatological era when the glory of God is revealed on earth (Isa 40:5, 60:2-3, Zech 2:5). The glory of God was formerly confined to heaven, and subordinately appeared in order to fill the holy and holies in the tabernacle and the temple. But eschatologically God will come to earth in his majesty. In those days the heavenly reality with supersede the earthly symbolic reflection. The heavenly original will fill and transform what was shadow. Hence those days imply a revision also in Aaronic priesthood (Ps 110:4), and by implication a revision of the law, which is bound up with the priesthood (Heb 7:12). But more than that, they imply a revision in the existence of Israel itself, since Israel itself is constituted as a kingdom of priests (cf. Isa 66:18-24). Since the existence of Israel itself has symbolic and heavenly overtones from the beginning, the fulfillment of prophecy encompasses these same overtones. The eschatological time is the time when the symbolic overtones in the very nature of Israel itself are transformed into reality. Consider now what this meant for Israel’s perception of the nature of the land of Palestine. The land belonged to God (Lev 25:23). It was not to be desecrated by unclean practices (Deut 21:23, Lev 20:22-24). In an extended sense, the land itself was holy, the dwelling place of God. As a holy land, it was modeled after God’s rule over his heavenly dwelling. But it also illustrated what God would do to all the earth in the latter days. God’s kingdom would come to earth as it was (in OT times ) in heaven. The land of Palestine was also analogous to Eden (Isa 51:3). It pointed back to what Adam failed to do. Adam’s dominion over Eden (the starting point for rule over the whole earth) was ruined by the fall. Israel was granted dominion over a “new Eden.” This dominion over Palestine in turn anticipated the full dominion that was to be restored by the “seed of the woman,” one born to be the “last Adam” (1 Cor 15:45). All this means that it is a violation of grammatical-historical interpretation to read prophecy flat. It is even a violation to read Israel’s history flat. The history of Israel has some symbolic overtones derived from the symbolic dimension in Israel’s own existence as kingdom of priests. But eschatological prophecy is the point at which these symbolic overtones are bound to be emphasized and come out into the open, since that is the time of transition from the preliminary to the final. In the course of the chapter, Poythress makes a very compelling case that seeing the body of Christ as fulfillment (or at least participating in fulfillment) of Old Testament prophecy is not “allegorically spiritualizing” OT texts, but is instead interpreting them according to their gramatical-historical intended meaning. One more difficulty arises in relation to typology. It is this. As I argued in the previous chapter, the significance of a type is not fully discernible until the time of fulfillment. The type means a good deal at the time. But it is open-ended. One cannot anticipate in a vague, general way how fulfillment might come. But the details remain in obscurity. When the fulfillment does come, it throws additional light on the significance of the original symbolism.